The year is flying past and now there are only FIVE weeks to go until Christmas! Yikes! Time to start thinking about what central decorations should be about if you’re hosting Christmas lunch. You can create a beautiful traditional advent wreath or do something a bit more modern. The good news is we can help you with that, we have Christmas workshops that are close enough to the day to ensure you have a wonderful centrepiece for the holidays! Even if you aren’t hosting Christmas, it’s still a good time to be out in the garden (or visit someone else’s if they are inclined) or visit a floristry nursery and luckily, it’s not been too hot yet. I’ve certainly been spending plenty of sourcing wonderful materials for the festival season! Although its not been too hot yet, things can get pretty dry fast. Ensure your plants and flowers are watered regularly, take time to soak your oasis and top up the water in your vases consistently. This will allow your blooms and creations to last that bit longer! The November birth flower is the chrysanthemum. The brilliant yellow chrysanthemums are a symbol of the sun and also the birth flower for (no doubt) happy and sunny-tempered November babies. 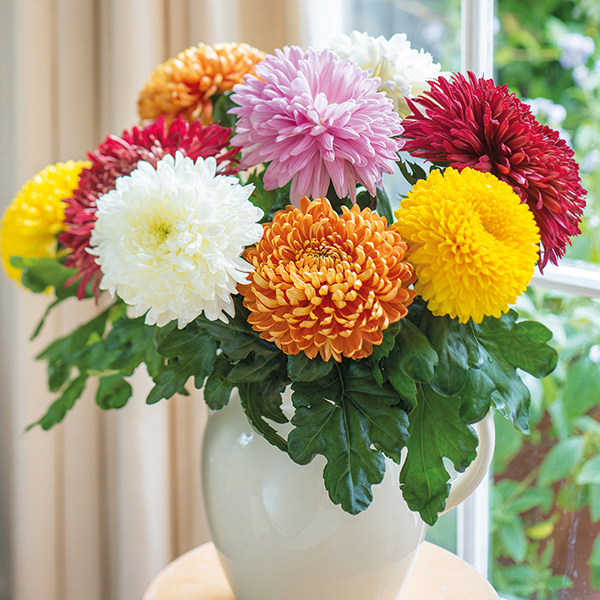 Chrysanthemums traditionally symbolise compassion, friendship, joy. Different colours can also have different meanings. Red is for love, white means innocence, and yellow denotes unrequited love. The name “chrysanthemum” is derived from the Ancient Greek: χρυσός chrysos (gold) and Ancient Greek: ἄνθεμον anthemon (flower). We would like to take this opportunity to thank you all from the bottom of my heart for entrusting us with your Floristry Training needs this year.With the time away in Germany in the middle of the year, attending the wonderful Workshop with Gregor Lersch, this year seemed even shorter than usual. The last few weeks will be filled with Pre-Christmas Preparation and our popular Christmas Workshops. See dates and link to detailed information below. For those of you, who would like to either brush up on their skills or learn new ones. My Advent Wreath making skill will come into play this year, as I will immerse myself into the traditional craft of a homemade wreath out of conifers and real candles with fragrant botanicals. If you like to learn how to make your own, I will run a workshop on just that on Saturday 1st of December, making it just in time for the first of Advent the day after.